It’s a good thing I can find entertainment in baseball unrelated to the success of the Marlins, who haven’t been to the playoffs since 2003. So here are some highlights of 2015, a Top 10 of sorts. 10. 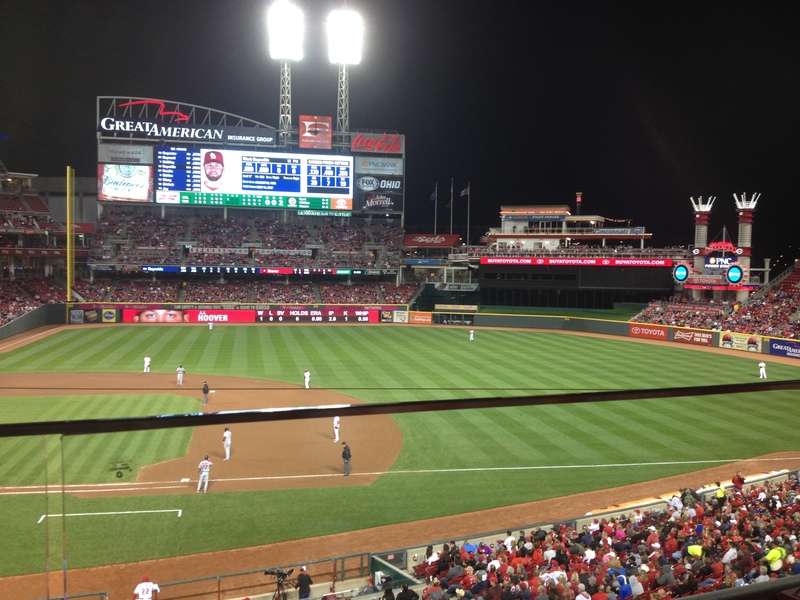 The number of MLB parks I’ve visited including Great American Ball Park: The home of the Cincinnati Reds became my 10th current MLB stadium when I saw the Reds defeat the Cardinals back in April. Great American is unique and in a nifty location right on the Ohio River, and I’m definitely looking forward to seeing another game there. 9. Approximately the number of seconds Mike Jirschele had to decide whether or not to send Alcides Escobar home in the Royals’ first at-bat of the 2015 World Series. 2014’s Game 7 ended with the Royals’ tying run on third base after Jirschele chose against sending Alex Gordon home on a would-be inside the park home run. Fittingly, Escobar kicked off this year’s World Series with a stand-up round-tripper on a fly ball booted by Yoenis Cespedes. Jirschele didn’t exactly face a tough decision this year as Escobar would clearly be safe, but it was a good omen for KC to start off on the right foot. They defeated the Mets in five games. 8. The number of players projected 2016 Marlins starters that I’m excited about. With All-Stars Giancarlo Stanton and Dee Gordon returning, along with left fielder Christian Yelich coming off a .300 season, the top of Miami’s order will be something to boast of. First baseman Justin Bour finished fifth in the NL Rookie of the Year voting in 2015 and is a true power-hitting left-handed first baseman, a luxury the Fish haven’t possessed since the days of Carlos Delgado. Behind the plate, J.T. Realmuto looks to be the catcher of the future for Miami. He swatted 10 home runs in 2015 and has superb speed for a catcher. Adeiny Hechavarria and Martin Prado will round out the infield. And Ace Jose Fernandez will surely take the hill. The only position up in the air is the centerfield slot, currently occupied by Marcell Ozuna. 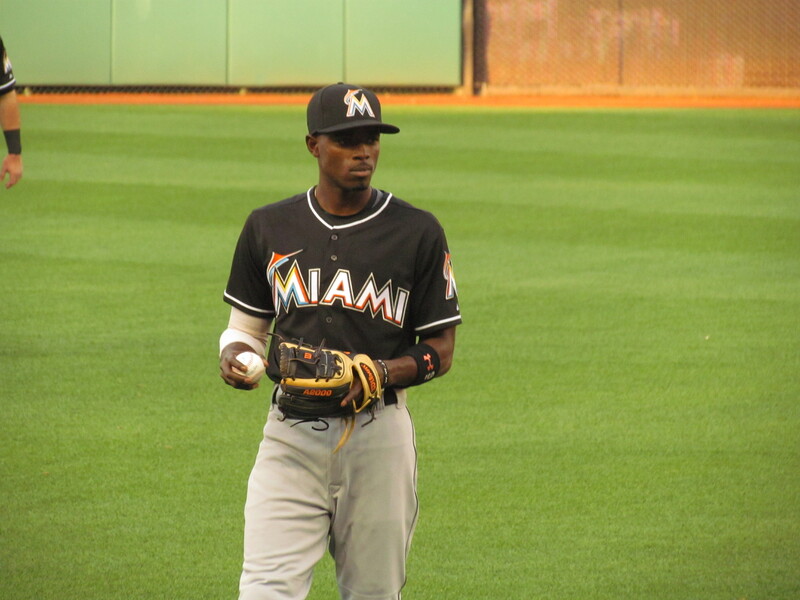 The Marlins have been looking to trade the youngster, according to reports, after he slumped in 2015. 7. The number of years, including 2015, to which Christian Yelich is signed to the Marlins. Yelich finalized the deal with the club before Opening Day 2015, and the Marlins are reasonably excited about the budding star. Once a first-round draft pick, the left fielder won a Gold Glove award in 2014 and hit .300 over 126 games in 2015. He’s a versatile, top-of-the-order kind of hitter who manages to get on base and make things happen. 6. The number of flags currently hanging in my apartment. They belong to the United States of America, Maryland, Ohio, the Canadian province of Ontario, the Republic of the Marshall Islands, and the University of Dayton. Flags are an easy and festive way to decorate a living space, and doing so gives appreciation to vexillological masterpieces–like the proposed new flag of New Zealand (left) that will be voted on in the spring. 5. The number on Brad Miller’s Seattle jersey. I got to see my favorite American Leaguer in action at Oriole Park in May. This offseason, Miller was traded to the Tampa Bay Rays along with former Marlin Logan Morrison (who wore #5 in Miami). Miller is from Windermere, FL, just east of Orlando, so joining the Tampa team will be more or less a homecoming for him. I’ll miss seeing him in Mariners teal, but now I’ll have more of a reason to root for the Rays. 4. The number of games I saw in one week at Nationals Park. It may have been their worst week of the season, but I thoroughly enjoyed the first week in August when Paul and I attended four games in one week. 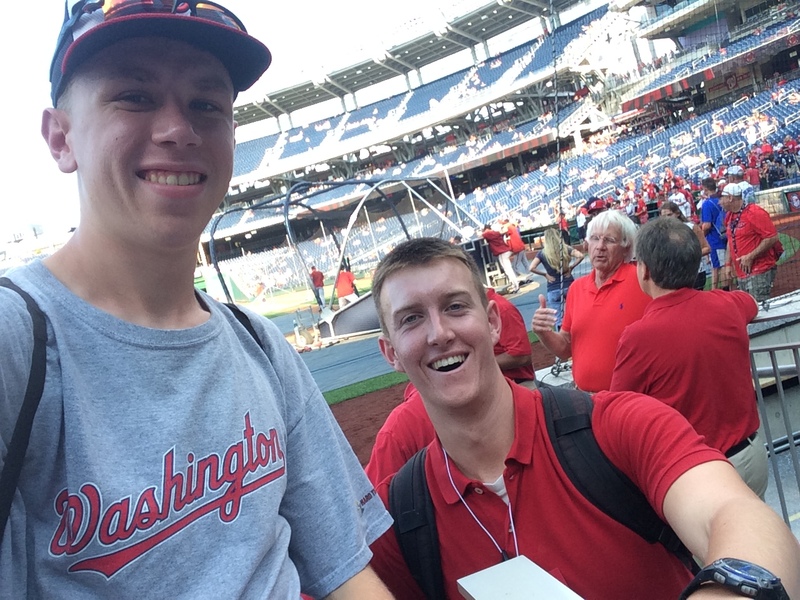 Complete with a chia pet, a Dan Uggla BP homer, and some accidental trespassing, it was a thrilling baseball-filled week that we may try to replicate in 2016. 3. The number of months Giancarlo Stanton played in 2015…and still managed to hit 27 home runs. He averaged about one homer every 10 at bats until he broke a bone in his hand by, literally, being too strong. He’s suffered some unfortunate and freak injuries thus far over his career. With any luck he’ll hopefully complete a full season in 2016 and maybe finally lead the Fish to a .500+ season. 2. The number of teal stirrups Steve Cishek will don in 2016. His right and left ones, that is. Cishek, a Marlin from 2010-2015, signed with the Seattle Mariners this offseason. Assuming he stays with his stirrups, his teal lower legs will make up for Brad Millers’ moving to Tampa. 1. The number of home runs Dan Uggla hit this season with the Nationals…and boy was it a big one. In one of the greatest baseball comebacks in my memory, Uggla capped a wild 13-12 win over the Braves in Atlanta. The Nats were down by eight runs early on and chipped away until Uggla came through with his ninth inning homer, part of a 5 RBI night for the slugger. Had Washington not collapsed in August, we would be pointing to Uggla’s April heroics as the turning point in the Nationals’ season.